Looks Good from the Back: Adrien: Tacky is as Tacky Does. 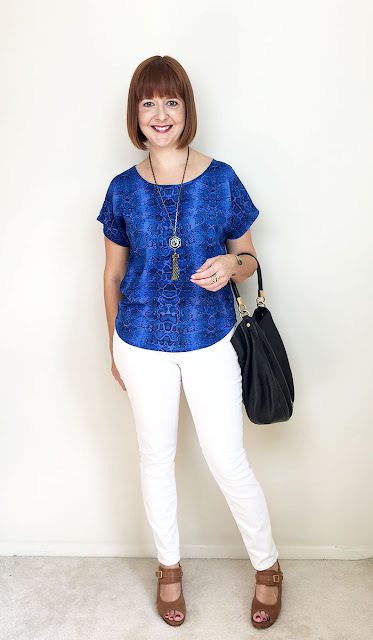 Here's what I like about summer clothes: they can be cheap and that's okay. 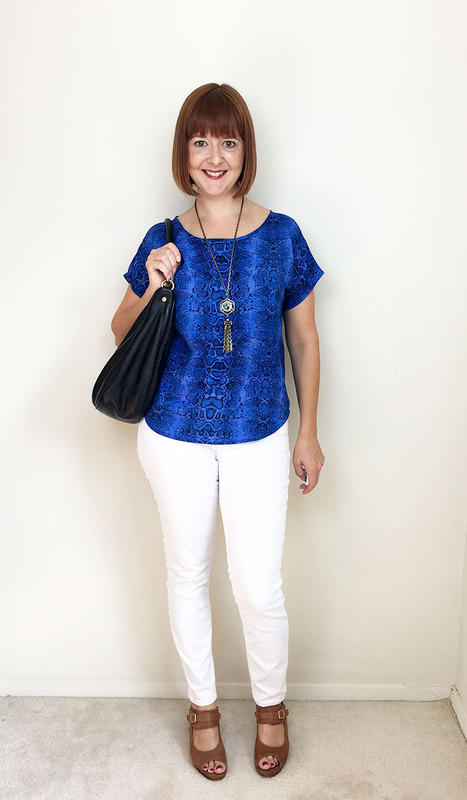 While I am generally trying to be more thoughtful about my purchases these days, I still have quite a bit of cheap summer filler in my wardrobe and this Ross top is the cheapest. But you know what? It looks so cute! I'm sure there are plenty of people who think snakeskin is tacky but I think it's fun. And hey, this amazing wallet ain't tacky, right? I totally dig this The Kooples python top and how beautiful is this Ramy Brook tank? 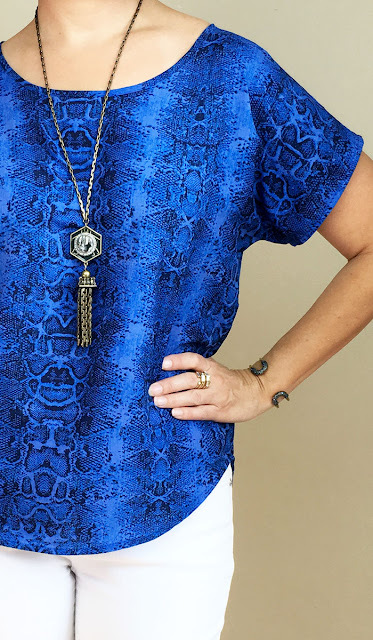 And if we're getting fancy with the blue snakeskin check out this Michael Michael Kors blouse. I'm wearing a giant Lulu Frost for J.Crew tassel necklace of the type that you know I love. This one by Baublebar is the best kind of crazy and I love this more delicate double tassel from Rebecca Minkoff. And oooh, these earrings. My bracelet is an encrusted version of the Giles and Brother skinny cortina bracelet and my big ole ring is Alexis Bittar from last year's Box of Style. This one is a less blingy version and OMG that boy is nuts. I love it. I don't usually bother to show off my ear flair (GIANT EAR PIC WUT) but today I'm wearing my adorable Shashi Noa ear climbers (another Box of Style win) and a pair of Kate Spade square drop earrings in turquoise. I can't find the drop style in this color but these Kate Spade studs are similar. 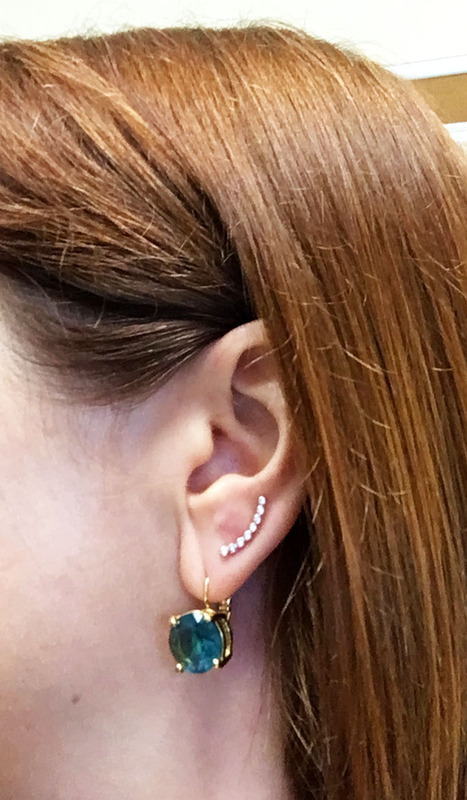 Or, hey, glitter studs! I just talked about my MBMJ Too Hot To Handle Hobo but isn't it good? 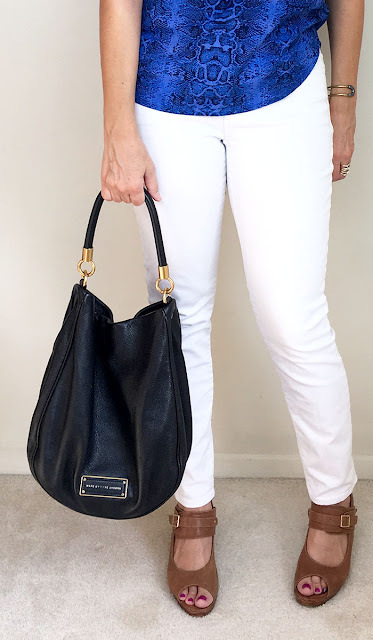 I can't recommend a nice Marc Jacobs hobo enough. I'm also wearing my much-loved Chie Mihara sandals! This lovely pair is probably the closest in style (and also come in grey) and if you're a size 11 please buy this beautiful pair because they're under $100 and that never happens. That is all. Is this a zipper to hot to handle or a magnetic closure? This one is a magnet.